No lifting or tipping is required with this Airpot! Overcup dispenser with stainless steel liner and body, plastic lid. In built cup station to pour the water into. Suitable for hot and cold drinks. Easy pour lever takes away the strain of lifting akettle. Holds 3 litres. Keeps fluid hot for up to 4 hours. No lifting or tipping is required with this Airpot! 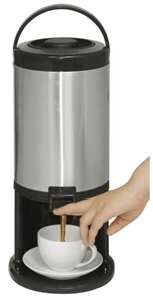 Overcup dispenser with stainless steel liner and body, plastic lid. In built cup station to pour the water into. Easy pour lever takes away the strain of lifting a kettle. Holds 3 litres. Keeps fluid hot for up to 4 hours.